Another fine Christmas ornaments machine embroidery design set. The set includes 4 freestanding lace designs . Using them you can create a nice Christmas tree with mini rose decorations. The lace tree can be either used to hang (e.g. on a Christmas tree) or as a stand alone decoration. 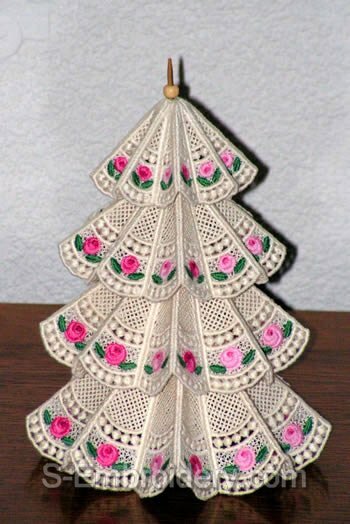 The lace Christmas tree featured on our site is 7.5 inches (19 cm) high. The diameter of the largest circle (already folded as seen on the pictures) is around 5.5 inches (14 cm). The set is available in 2 variants - one is for 4x4 hoops and the other - for 5x7 or larger. 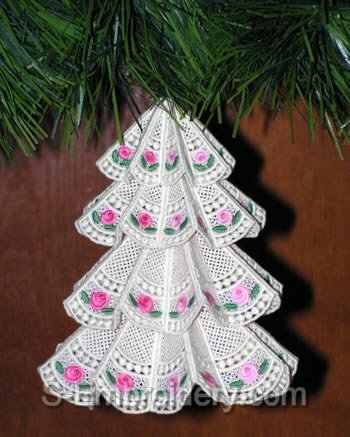 The stitched out freestanding lace Christmas tree is the same size in both cases. The difference is in the way the designs are split and placed in the hoop.